Your tween is sliding on his Converse as he jets off to another day of school. While you can’t monitor his every move, you can promote smart safety habits to help him make smart decisions and stay away from harm. Share these vital safety tips with your little one for back-to-school safety. Whether your child plans to walk, take the bus or ride to school with you, traffic safety practices help reduce transportation injuries. Children who ride the school bus are actually in pretty good hands. Children who ride the bus are 13 times safer than those who ride in a passenger vehicle and 10 times safer than children who walk to school, according to the National Highway Traffic Safety Administration. Help your child learn and practice safety rules when riding, walking or bicycling to school, such as always crossing at cross walks, obeying all traffic lights and signs and never playing around with gadgets. It’ll never go away. Whether it’s online, in the schoolyard or on the bus, kids are cruel. The National Education Association notes that approximately 160,000 kids don’t go to school each day because they fear being bullied. Invest in your children every day so you can recognize the signs of bullying early on. Help build your child’s self-esteem through confidence-building exercises, such as looking at people in the eye and speaking up when they talk to show authority. If your child is like most tweens his age, his love for outdoor fun may get the better of him from time-to-time. More than 200,000 children age 14 and younger in the U.S. are treated in the emergency room each year due to playground-related injuries. 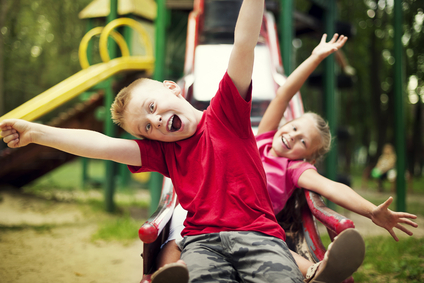 While chasing friends around a playground and hanging form the monkey bars, kids forget about following the rules. Find out what your child’s school playground rules are and review them thoroughly with your child. You can’t always stop an injury from occurring, but you can be quick to respond. Be prepared to deal with broken bones and other conditions in the event of an emergency. Many tweens are mature enough to spend time alone after school. This doesn’t mean you shouldn’t take the proper precautions to ensure that your child is safe and secure. Establish an after-school routine and set a time for your child to be home every day. Make sure he calls if he is going to be late. Enforce a strict policy that bans opening the door for strangers or telling callers on the phone that no adult is home. Many parents feel most comfortable by hiring security companies to install security cameras, home alarms and other gadgets that help keep children safe at home. Thanks for the tips about school danger!! Some it I did even know about!! Very helpful!! i love all these campaigns! they are very important especially in this day and age where bullying seems to have evolved! really awesome cause i love how powerful it can be!